France Télévisions is deploying the ATEME Kyrion video CM encoders. Paris, June 2015: ATEME has announced that France Télévisions is deploying the Kyrion CM encoders to power its nationwide IP contribution network. With over 100 sites, the French public broadcaster contribution network is one of the largest IP-based networks in Europe. The Kyrion encoders enables a H.264 HD upgrade, as well as supporting the legacy MPEG2 SD format. To learn more, please visit www.ateme.com. 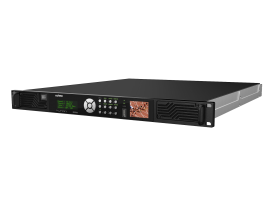 The Kyrion encoder has been designed for contribution over satellite, IP and ASI networks, with advanced features such as ultra-fast-boot, and added value features including ABR output and integrated Automatic Repeat reQuest (ARQ). The Kyrion CM5000 is based on the ATEME 5th Generation STREAM compression engine, and delivers the highest video quality at minimum bitrates with ultra-low latency. The Kyrion CM5000 is a future-proof solution, with a HEVC software upgrade option.